Leila Sales' debut novel This Song Will Save Your Life was among my favourite reads of 2014 and I can't wait to see what she does next. The premise of this book sounds like it'll deliver another stellar story, and I am especially intrigued by the blogging side of the story. Any book about bloggers has me interested. Also, the cover is absolutely gorgeous. How could I possibly resists? 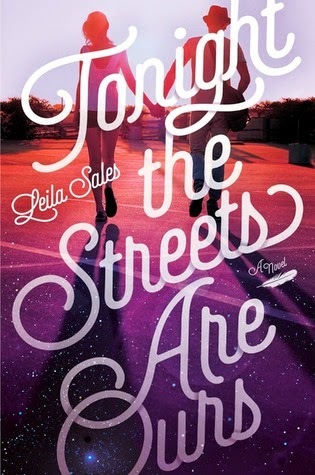 Tonight the Streets Are Ours hits shelves on September 15th, 2015! I love the cover! It seems really interesting too. I haven't read her other book, but I always see it at Barnes and Noble. I don't read a lot of contemporary fiction, but I really want to give the genre a fair chance before I say that I enjoy it! This book seems like a fun read! and you're right, the cover is lovely! Isn't the cover absolutely gorgeous?! You should definitely give This Song Will Save Your Life a shot, it's one of the most heart wrenching contemporaries I've ever read! It's always good to give things a go before saying no! I think that Leila Sales' first book, This Song Will Save Your Life, is a great way to get into contemporary fiction!